The US-based LED lighting manufacturer and distributor has donated over $60,000 worth of their ThruLine Under Cabinet LED Fixtures. As owners of a company headquartered in California that manufactures energy-efficient lighting, we at Alloy LED felt like we were in a unique position to help Habitat for Humanity in their mission to provide affordable housing and furnishings to families in northern California. Alloy LED has made a donation of the first generation of their ThruLine Under Cabinet LED Fixtures, worth over $60,000, to the northern California chapter of Habitat for Humanity. The Energy Star rating for this under cabinet light guarantees a superior combination of energy efficiency and quality of light for residential and commercial installations. ThruLines feature a high CRI value of 90+ CRI, which means they render colors, especially warm tones, accurately. Alloy LED Marketing Director Dan Nelson says, "As owners of a company headquartered in California that manufactures energy-efficient lighting, we felt like we were in a unique position to help Habitat for Humanity in their mission to provide affordable housing and furnishings to families in northern California. These fixtures not only provide great-looking light and have a long lifespan, they also ensure that energy savings are passed on to those who benefit from Habitat’s services. They’re also a fixture that’s familiar to most electricians, making it a fast installation for Habitat’s volunteers." 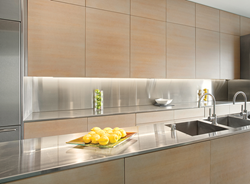 ThruLine fixtures offer a variety of benefits for under cabinet LED lighting. These Energy Star-rated LED fixtures connect directly to AC house power, with no need for an external transformer, which makes installation quick and easy. The fixtures emit bright, warm light that can be dimmed using a common household dimmer switch, and with the diffuser cover, the LEDs emit a smooth, even light with no hotspots. Sturdy construction provides protection from dust, grease, and moisture and ensures years of use.